Though low-carb diets have been in and out of fashion for years, the Ketosis diet has seen a resurgence in popularity lately due to its effective weight-loss results in addition to other health benefits. Ketosis is when your body is forced to use stored fat for energy instead of readily available carbohydrates, so in many ways, Keto sounds like the perfect diet change. 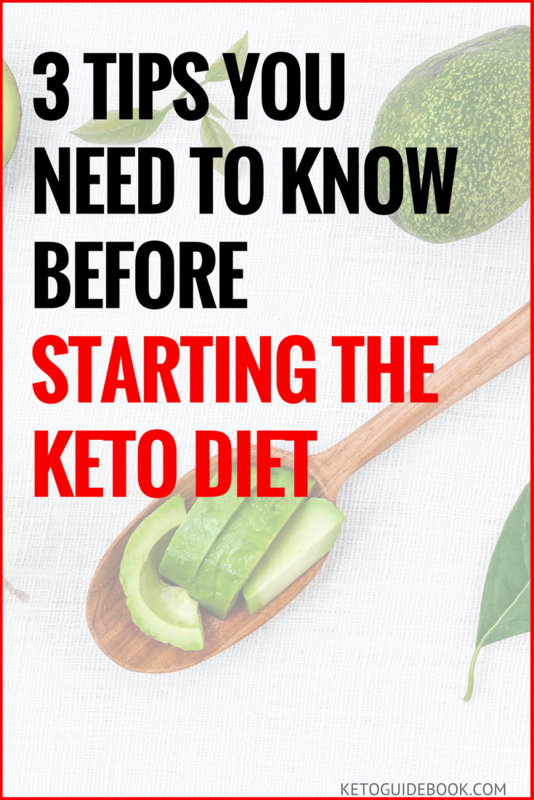 But if you are considering this diet change, here are three tips you need to know before starting the Keto diet so that you can decide whether the Keto diet is right for you. On the Keto diet, you are generally recommended to lower your daily allowance of carbohydrates while significantly increasing your fat intake and moderately increasing your protein. Going against “conventional” wisdom, the Keto diet insists that full fat is good for you. When you first start the Keto diet, you might notice a significant drop in weight. This is your body letting go of fluids that were being retained as a result of excessive carbohydrate intake as the body retains more water in response to your body’s glycogen levels. Glycogen is the body’s way of storing carbs for energy at a later time and when you lower your intake of carbohydrates, your body no longer has those stores to fall back on. This is what you want with the Keto diet. When your body no longer has glycogen to rely on, it instead uses the excess fat in your body for energy. This is why it is so important to eat enough fat and protein as it will help keep you satiated during the day and won’t impact the glycogen levels in your body. So seek out those healthy sources of fat (grass fed butter, almonds, avocados) and get eating. This is going to be the biggest mental hurdle that you are going to have to overcome. Everyone has become so dependent on the quick energy that carbohydrates provide that their bodies are addicted to them. When you first start the Keto diet, your body is going to crave carbohydrates, but you need to resist the temptation to give in. Once your body acclimatizes to the lack of carbs, you will likely find that you have more energy than before and less “sugar crashes.” Your body takes longer to break down fat than carbohydrates, which will contribute to you feeling full longer. It also means that you will feel full more quickly and likely eat less as a result. While vegetables and fruits have carbs, you can choose to eat vegetables that are lower in carbs than others, such as kohlrabi, leafy greens or cauliflower. Fruit is very high in sugar and should be avoided on the Keto diet for the most part. You don’t only have to eat meat and butter on this diet and once people get used to eating Keto, they often find that they are able to eat just as many varied and delicious offerings as before starting Keto, but their bodies feel much better for it. If you follow the Keto diet and manage to keep your daily intake of carbohydrates low, you will very quickly notice the fat being eliminated from your body. Because you no longer rely on carbohydrates to fuel your body (that easy access to glucose), your body instead seeks out your fat stores to energize itself. But the old adage really is true; muscle weighs more than fat, so although you will be losing body fat, your scale might not reflect the change as much. Do not lose heart and don’t give up. On the Keto diet, it is a good idea to measure your body (neck, waist, hips) so that you have a tangible number to compare your progress to (but you are going to notice it in your clothing size as well). Eliminate the need for your scale to validate your change and keep at it–while you revel in the compliments from friends, coworkers, and family who are all going to want to know how you did it. As with any diet change, it is important to include your doctor in your plans, especially if you have chronic health issues. But with persistence and a strong will to commit, you might find that Keto is the diet you have been looking for. These three tips you need to know before starting the Keto diet will help you to prepare for what is to be expected on the Keto diet and will help to set you up for success.